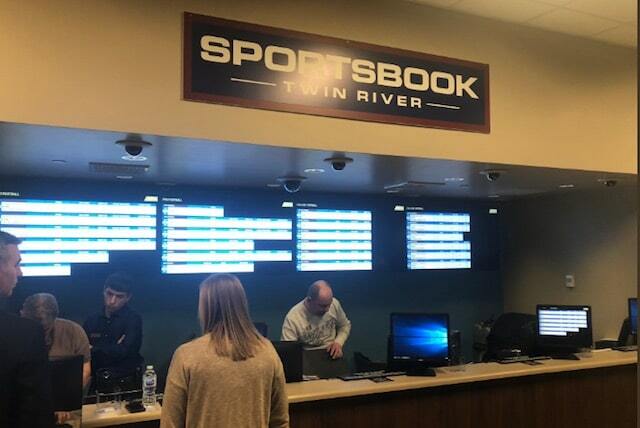 According to the Providence Journal, the Twin River sportsbook is currently located on the casino’s third floor, where simulcast horse and dog races can already be viewed. The area has theater-style seating, including an old grandstand that looks out on the old greyhound track outside. Bettors have individual monitors on which they can watch games, as well as a view of the outdoor tote board. Twin River expects to open its 3,600-square-foot sports betting “social” space in December. The new space, which will feature tables and chairs rather than stadium-style seating, appears to be modeled after a sports bar. The location is in the casino’s Wicked Good Bar & Grill, and will accommodate about 200 people. Both the Twin River and Tiverton sportsbooks will be run by William Hill and IGT, the state lottery’s two approved vendors. William Hill will handle risk-management and IGT will provide the sports wagering platform technology. The initial contract for services is five years, with a renewal option. Patrons will be able to place bets on the NFL, Major League Baseball, NBA, NHL and collegiate events that don’t involve Rhode Island teams. However under current regulations, sports wagering is not permitted via mobile apps off-premises from the two casino locations. Rhode Island is the first mover in New England, where the closest legal sports betting is in either New Jersey or Pennsylvania. Though Connecticut and Massachusetts lawmakers have opened the sports betting conversation, neither state passed any legislation in 2018 and there have not been any bills pre-filed for the 2019 session in either state. When recently re-elected Governor Gina Raimondo signed into law the bill that included sports betting, her fiscal 2019 budget included a $23.5 million line item for sports betting revenue. But the state, which levies a nation-high 51 percent tax on net sports betting revenue, will have to back off that number. According to a November report, Rhode Island lost about $12 million in potential sports betting revenue due to a nearly two-month delay opening. The delay was caused by extended negotiations between the state and its sports betting vendors as well as testing.